I've got a little Saturday post for you! Festival season is fast approaching and as my excitement brims for V festival, I thought I'd put together a few festival outfit ideas and make a little 'wishlist' - to inspire you for your own festival outfit's - where ever you may be! 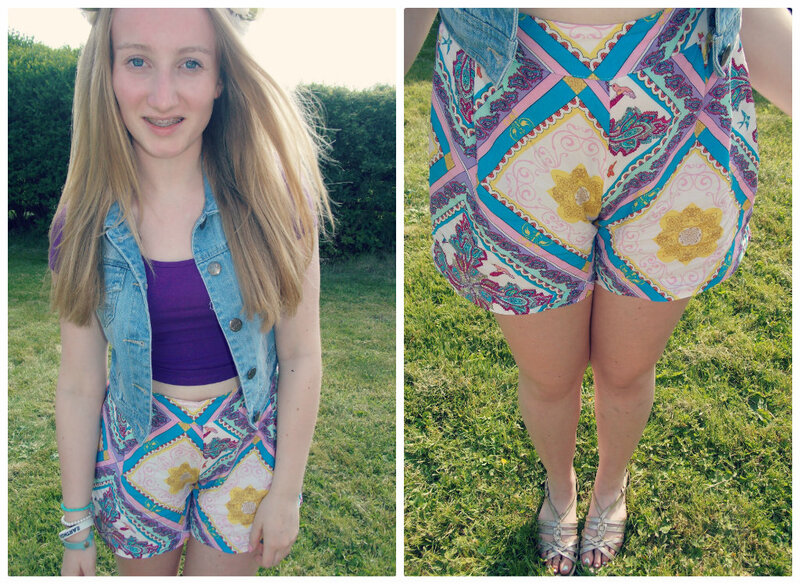 I wore this outfit, a few days ago when I was feeling summery, and it reminded me of festivals! The Shorts were a little bargain last year, £3.50 from Matalan (click here to see similar). I love the pattern on them and they're really colourful. They are also seriously light weight - so are great if its a warm day - or you need to carry them around for day 2! They're high waisted, which means you can get away with wearing a crop top, without having the whole of your belly on show (though, it kinda defeats the point of them.. but hey). The jacket was also another 'last years purchase' I've pulled out of my wardrobe - mainly as a way of proving to my mom, I DON'T need a spring clean out (even though I most probably do..). It was around £10 from Primark, and is great to dress up an outfit. I love the edgy sleeves and the light blue colour which matches up with pretty much everything. I love crop top's at the moment. This purple crop top, was part of a two for £8 offer at Newlook. I love it's simplicity, which means you can pair it up with pretty much anything! My headband was another recent purchase. I fell in love with Lana Del Ray's flower crowns and have been looking for one similar to the beauties from Crown and Glory. However, until I can save up some pennies, I found this thrifty crown, which was £3 from Primark. It's so cute, so I'm sure you'll be seeing alot more of it in future posts! 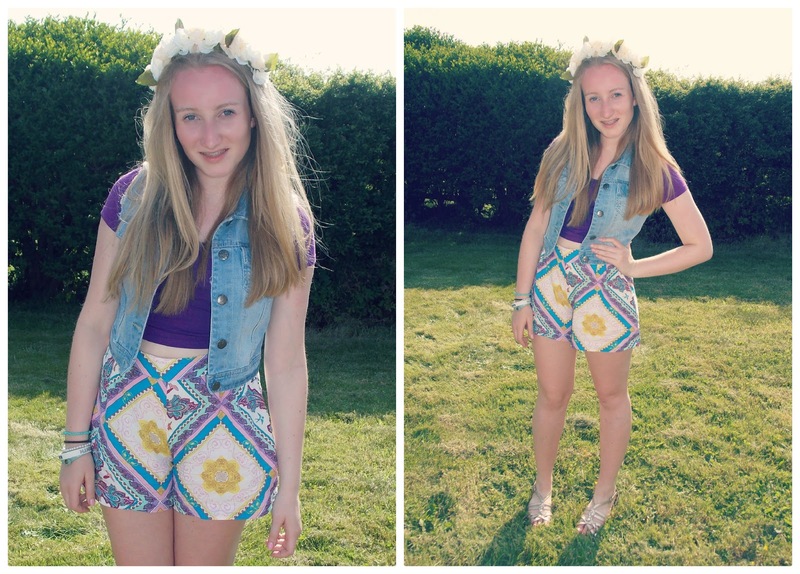 What Blondie's Wearing: Top - New Look, Shorts - Matalan, Shoes - Clarks, Jacket & Floral Crown - Primark. So that's all from me, I'm off to finish watching The Voice..
Hey blondie! you look lovely with that flower tiara! and nothing like denim vests to complete a summer outfit! You are going to look so fantastic in that! I love those shorts. I love that you bought that top because of me :D and now it's on your blog! It gives me a fuzzy feeling inside! Ha. Outstanding collection of western dresses,designer footwear,eyewear etc...lovely!!! acabo de descubrir tu blogy mea encantado.te gustaria que nos siguieramos?te imbito a pasar por mi blog guapisima besitossss. lovely snaps dear...I love these outfit and great Shoes for Girls ! !